As the voice of the food preservationist movement in New Orleans, Poppy Tooker, who makes a mean bowl of gumbo, swears by her grandmother’s rallying cry: “Eat it to save it!.” Walking the talk, she spends much of her time convincing cooks — Creole and otherwise — that the only way to keep the old recipes alive is to make them at home. Chances are you’ve heard of beignets — the fab fritters famously served at Cafe du Monde in New Orleans (and by Louisiana homeboy Casper Townsend in these-here parts at Casper’s A Taste of the South). But trust me: you haven’t lived till you’ve tasted Poppy’s rice-stuffed calas — among the iconic dishes important to the history of Creole culinary culture, says Poppy, who generously shares her recipe for this classic sweet once hawked on the streets of New Orleans. Calas: so good, and so good for you! 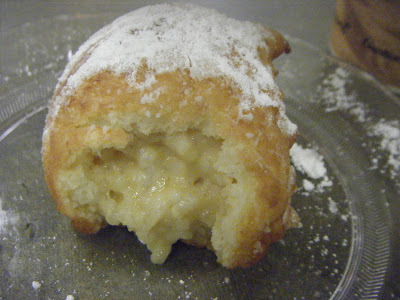 Enough already with the beignets! 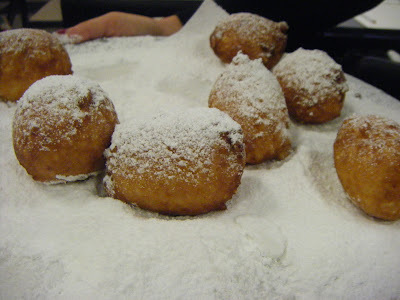 Eat some calas. Just one more bite. Please? In bowl, combine rice, flour, sugar, baking powder, salt and nutmeg and mix well. 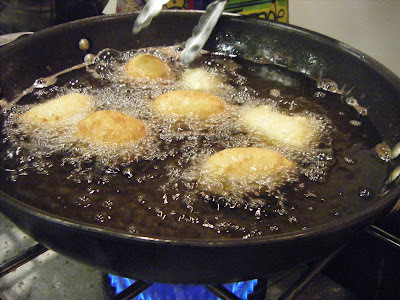 Heat vegetable oil for deep-frying to 360-degrees. Carefully drop rice mixture by spoonfuls into hot oil and fry until brown. Sprinkle with confectioners’ sugar. Serve hot.